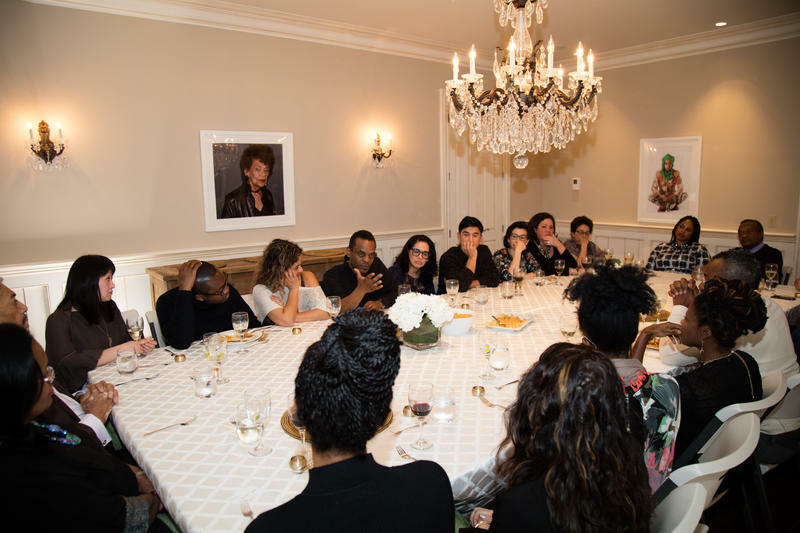 Since 2012, I have been organizing The Supper Club, which began as a photography project and series of three conversations over dinner amongst artists of color about visual culture and race. The first three suppers included 50 artists, each of whom I have photographed as part of a series of portraits that uniquely depict each individual. Participants include LaToya Ruby Frazier, Coco Fusco, Dread Scott, and Derrick Adams. The dinners were recorded and transcribed. I’ve organized over 30 dinners. The conversations initially addressed issues of agency, the role of artists and audience. However, with the killings of Michael Brown and Eric Garner in 2014, this shifted the conversations to address how people relate to each other amidst critical events. I also around that time I began to cook and invite hosts to assist in creating the guest list, provide the prompts for discussion and guide the conversation. We have had conversations that link race with subjects like Baltimore (a tribute to Freddy Gray); Transnational Black Identity; Racial Subjugation in Latin America; Sanctuary, the Orlando tragedy; and most recently gentrification and the role of the arts. A book on The Supper Club, produced by The Shelly & Donald Rubin Foundation, will be published by Hirmer, Spring 2019, and will be distributed in US and Europe.